A few weekends ago, my husband and I took our kids to Ringing Rocks Park, in Upper Black Eddy, PA. They had been there as toddlers (read on to figure out why taking a new-to-walking toddler there is NOT the best idea in the world! ), but, of course they didn't remember it. Over the years we had talked about it, usually laughing about our poor judgement on bringing toddlers holding hammers to a field of boulders. A warm Sunday afternoon, before baseball/soccer/track season started was the perfect day to head back -- this time with sure-footed pre-teens! Ringing Rocks County Park is located off Ringing Rocks Road in Upper Black Eddy, PA. It is about an hour drive from Madison, mostly along Route 78, with many miles of the drive through picturesque rolling-hilled farm land. We brought our lunch and ate it at the picnic tables in the island on the parking area. (FYI -- There is a port-a-potty at the parking lot, too.) After lunch, we grabbed our hammers (be sure to bring your own hammers -- preferably, one per person! ), and headed along the short path through the woods to the clearing called Boulder Field. 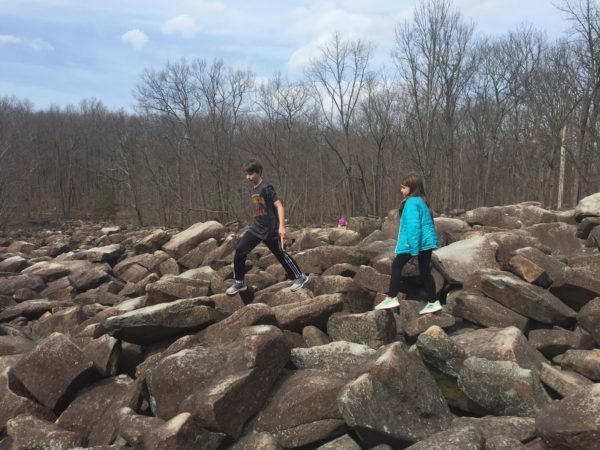 The 7-acre field is piled high with natural boulders (thus the name!). When you hit some of the rocks with hammers, they make an almost metallic "tingggg" sound. We spent about an hour climbing up and down the boulders, hitting them with our hammers, and calling out to each other when we found one that resonated. We enjoyed comparing the sounds, and even tried to play a few "rock" songs. We then put our hammers in our backpack, and continued along the trail to the 20-foot high Falls Creek waterfall, the largest waterfall in Bucks County. As the water approached the falls, it went along completely flat rock, then dropped down a sheer cliff face. Though there was very little water in the falls that day, the rock formations were absolutely beautiful! Some visitors (not us!) walked along the flat wet rocks at the top of the falls, even sitting along the edges. We, instead, chose to explore the rocks at the base of the falls for about an hour, which gave us a very nice view from below. On warm days, I am sure that the creek is a refreshing place to splash around. The trail continued to the left of the falls, but we decided to take that hike another day. Back along the original trail we went, taking out hammers out one last time to play a little "rock" song on Boulder Field.